Whether you’re planning for your Bali Honeymoon or just some time away with the special person in your life, then here are a list of amazing Resorts in Bali that are known for providing a couple friendly peaceful environment. These Resorts specialise in pampering couples, with access to massages and Day Spa’s, beautiful accommodation & surroundings and of course exceptional levels of service. 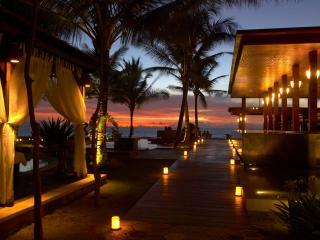 Each of these resorts offers special Bali honeymoon packages from time to time. To find these click on the resort names below, which takes you to a detailed Resort information page and click on the “specials” link. These Resorts are perfect for a romantic holiday or honeymoon. Located on absolute beachfront in Seminyak just 25 minutes from the airport, The Legian is a very exclusive five star boutique property which is receiving rave reviews from guests from all over the world. Style, romance and relaxation are the focus of the hotel. Each room is luxuriously appointed with first class bedding, quality in-room entertainment & communications including wireless high speed internet access, Bose hi fi systems. 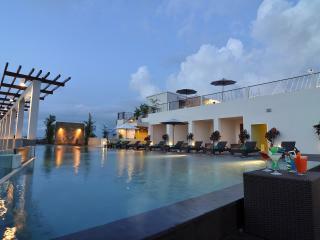 And your only moments away from the nightlife of Kuta and the shopping in Legian. The Samaya Seminyak is a beachfront Resort that specializes in serenity and relaxation. Its perfectly located to sit back and take in the setting sun from your room or by the amazing resort pool. The “Spa at The Samaya” is known for providing guests with relaxing and rejuvenating treatments in perfect surroundings. 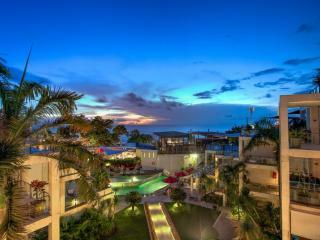 The Samaya has 46 very private individual villas, 24 which are beachfront and provide amazing views over Seminyak beach. The Samaya Seminyak could be the perfect romantic holiday. 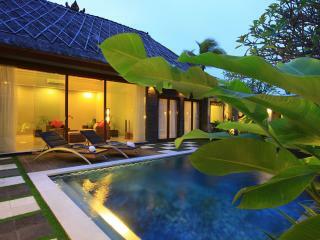 The Villas Bali Hotel & Spa is built with traditional Balinese architecture and of course peace and relaxation in mind. Conveniently located right in the heart of Seminyak, it’s in walking distance to the beach, top quality restaurants and fantastic shopping. The Villa Bali has a real feeling of seclusion and offers guests both Day Spa and Reflexology treatments on site in the Parana Spa and Chill reflexology centres. Aside from treatments the Spa also offers daily Yoga to help you totally unwind. The Villa Bali provides the perfect romantic setting for honeymooners or for those looking for a special experience. The FuramaXclusive Ocean Beach, Seminyak Bali is perfectly located on the beachfront of Legian and provides guests with a true beachside holiday experience. While not exclusively for couples this resort is one of the newest in Bali and has become very popular with honeymooners because of its location, quality and great value prices. The apartment style rooms are very modern and luxuriously appointed. You wont be disappointed. 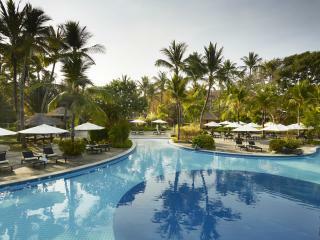 The Melia Bali Villas & Spa Resort is located on a beautiful stretch of Nusa Dua beach and is surrounded by lush tropical gardens to ensure privacy. This is a larger style resort with that caters for both families and couples equally well. The Melai Bali Villas has a well earned reputation of pampering Honeymoon couples and the Management pride themselves on the large amount of referral business, from the many happy ex-honeymooners many of whom return at a later date. The Duplex suites are highly recommended by guests and well worth the extra money to make your stay perfect.